This pattern is available from thepatternparadise.com for $6.99. THREE patterns in one! 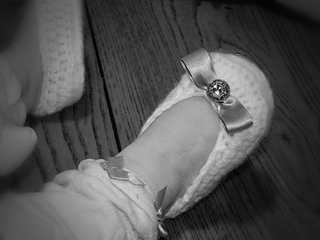 Pretty ballet slippers for Moms and daughters. I like to make them dressy with a pretty ribbon and decorative button, but you can embelish them a hundred different ways to make them your own. Extra cushy and warm with a shaped double sole. All sized included in one pattern! I used Caron SPA and Country, but you can use any light/medium weight yarn for a pretty effect.